The PL/SQL Analyzer provides information about PL/SQL source code. Its output describes the named objects of the source code and their relations. This helps in understanding of large software systems and it supports impact analysis. The tool scans SQL source code for declarations and uses of names. Names refer to objects such as for example packages, functions, procedures, tables, views, columns, and source files. The tool creates HTML pages listing the above objects and their relations as well as HTML versions of the source code. The relations can be represented by call graphs and usage graphs. The results can be viewed with any web-browser. 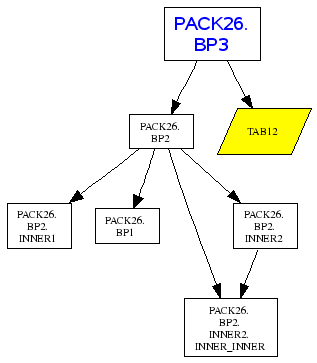 The above call graph displays the relations of function BP3 from package PACK26. The rectangles denote functions and the rhomboid denotes a table. The arrows represent the direct call and use relations, respectively. The function names are qualified by their package names. In the real version of the call graph the objects can be clicked, which will navigate to the call graph of the clicked object. The above source code is an excerpt of the HTML version of package PACK26. Different colors represent different kinds of names. In the real version the colored names can be clicked, which will usually navigate to the declaration of the clicked object. The HTML pages produced by the PL/SQL Analyzer from our source code used for testing is available for download. The test code is completely artificial and without any meaning. Nevertheless, it nicely demonstrates the capabilities of the tool. Just unpack the downloaded archive and start a web-browser on the file index.html.